Some commenters to the last post on Baked Chicken with Wild Rice asked what wild rice is, so here is some information about this grain. According to this source, wild rice (Zizania Palustis L)is of the grass family and is native to North America. It is known by many names: indian rice (by early English explorers), folle avoine (by the French), Canadian rice, squaw rice, water oats, blackbird oats, and marsh oats. 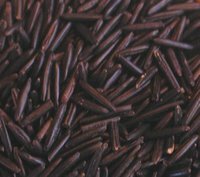 Wild rice has high protein and carbohydrate content and would be perfect for someone in need of fiber or quality carbs in their diet. I like it because of the nutty flavor and the different texture from the usual white rice. For additional information, click on the photo above or visit http://www.wildrice.org/. 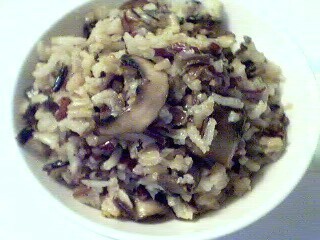 If you would like to try another wild rice recipe tested In Our Kitchen, try our Wild Rice and Mushrooms recipe that we had as a side dish for Thanksgiving. The Indians used to gather it when I lived in Northern Minnesota…we used to eat it at all the tribal parties…yum. Hi rachel, that’s right. If you get it uncooked, it does take some time to cook it. However, I think the ones that are mixed with other rice is pre-cooked so it cooks at the same rate as the rice. It still retains a lot of its body though, giving it the nutty texture and flavor. One of the morning shows had a segment on wild rice this morning. I knew it was really part of a grass rather than a rice, but the cook said to treat it like pasta when you make it-boil it for 40 minutes in a big pot of salted water. who knew?